GiLoCatur was at Ampangan Plaza located near Seremban, Negeri Sembilan today because both Fikri and Fahim Al-Faqeh took part in the Ampangan Age-Group chess tournament. 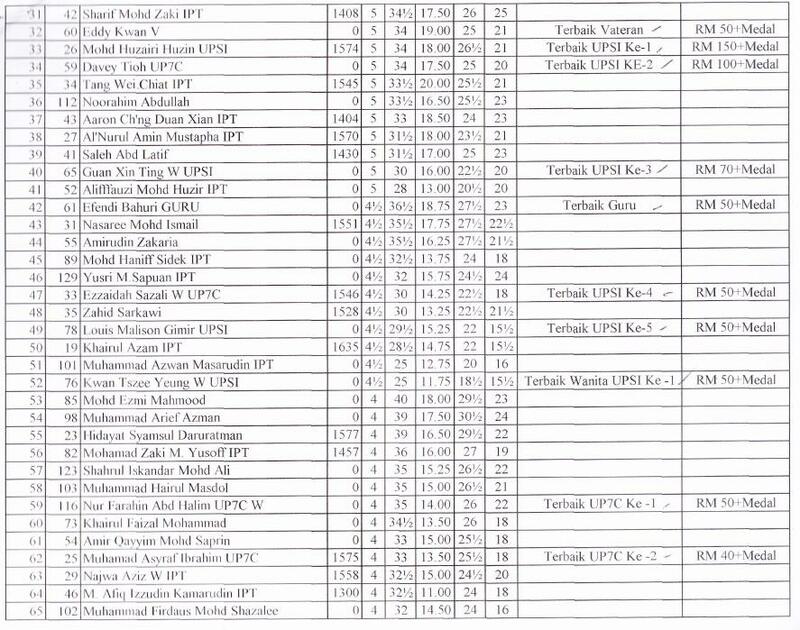 The former played in the Under 18 category together with 64 other participants while the latter was among twenty three (23) Under-12 players. The Under-18 section played six (6) rounds whereas the Under-12 category played five (5) rounds only. Below are several interesting photos of the tournament. GiLoCatur had witnessed a new style of playing chess in this tournament. Both players were standing while playing. Never GiLoCatur seen in any chess tournament before. Maybe this new style of play is due to the chess table and chair. WHO SAY CHESS IS NOT A SPECTATOR SPORT. TWO PICTURES BELOW CONFIRM THAT A CHESS MATCH CAN ATTRACT LOTS OF VIEWERS ESPECIALLY WHEN THERE IS DRAMA. The Open category will be held tomorrow. GiLoCatur believes new entry will still be accepted and no late fee will be charged. Just come before 10.00 am. 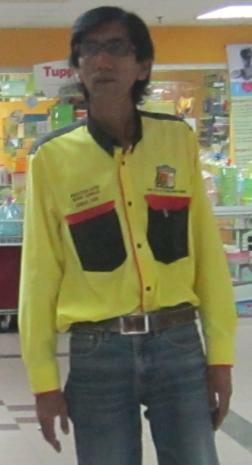 Please contact Kamar Dani (below picture) at 019-344 5343. FIVE Chess Tourneys This Weekend, Ya'll! It is going to be fun and thrilling for all the Malaysian chess lovers this weekend. At least FIVE chess tournaments to be held. What are the tournaments? The first one is a nationally rated tournament to be held at SJK (C) Kepong 2. The tournament is for the age groups of U8, U10, U12 and U16. The junior participants will play seven rounds of 25-minute-per-player match. The second tournament is held on two weekends. The venue of the tournament will be at Bukit Kiara Royal Selangor Club. Three (3) rounds will be played this weekend and the other four (4) will be held on next weekend on the Hari Raya Haji. The champion will be awarded six hundreds Malaysian Ringgit and a trophy. 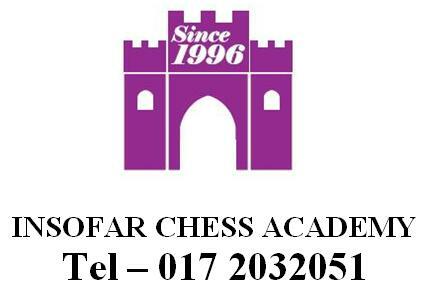 The third one is organized by Johor Chess Association. There are three categories - Open, Under 16 and Under 12, in the tournament. Interestingly, the tournament will be held at the 35th floor of JB City Square Tower. While many N9ers will travel to Shah Alam on the weekend night to support their state team in the final Malaysian Cup, its Ampangan Plaza will host a chess tournament during the weekend. The age group - Under 18 and Under 12, will be held on Saturday while the Open category is scheduled on Sunday. In this tournament, only SIX rounds will be played. The last tournament is organized by Insofar Chess Academy. It is for the first time that its tournament to be held in Perak, KAMUNTING to be exact. The registration is still open and the tournament fee is only RM20. So, you can choose any of the above five chess tournaments. Lots of prizes to be won. What a treat for the Malaysian chess community. Where GiLoCatur and the kids will be? Let's wait and see! GiLoCatur would like to wish GOOD LUCK to the Malaysian team that will take part in the World Youth Under 16 Chess Olympiad scheduled from 24th October until 1st November. The Malaysian squad left for Izmit, Turkey for the World Youth Under 16 Chess Olympiad at 10 AM, 23rd October. The squad consists of Roshan, Jianwen, Eng Chiam, Elgin and Li Tian. The Team Manager is Mr. Lee Ewe Ghee. The send off at KLIA was officiated by MCF Deputy President, Tuan Haji Ibrahim Abu Bakar. There will be 27 teams participating this year. Russia is ranked first with an average rating of 2455, followed by Azerbaijan (second) with rating of 2361 and India with a rating of 2351. Malaysia is ranked 10th with an average FIDE rating of 2058. There will be three GM's and three IM's with numerous FMs participating in the Under 16 Chess Olympiad this year. The official website for the tournament is on http://wyco2011.tsf.org.tr/, and it is reported that the all boards will be broadcast live. Get more details of the players, schedule and results from the tournament that will start at 10PM KL time, 24th Oct.
5th UPSI Chess Open - GiLoCatur "MengKerojekan" Or "Dikerojekan"? 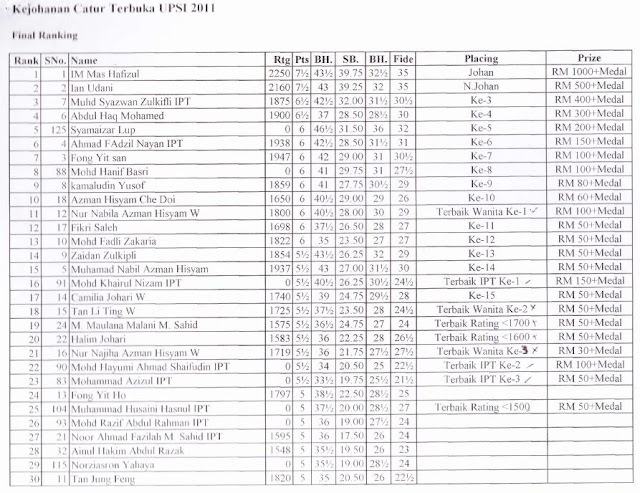 Of the five UPSI Chess Open editions, GiLoCatur only had participated in two of them. GiLoCatur took part for the first time in the 2nd edition in 2008. During then, GiLoCatur's national rating was just 939. GiLoCatur scored 3.5/7 points and was placed 43rd out of 81 total players. In that tournament, GiLoCatur consistantly played Queen Gambit when playing white. GiLoCatur also had an interesting and balanced match against a 1600+-rated opponent. Obviously at that time, GiLoCatur's endgame far weaker than today. After three years, GiLoCatur has improved much better. The ratings has jumped from below 1000 to more than 1400 better by 400 points. Last weekend, GiLoCatur won five (5) games and lost the other three (3). A good result for GiLoCatur to be among the top 40 out of total 130 participants. GiLoCatur was seeded 41st. The seeding is actually not accurate since many more rated players whom ratings were not listed. It is either the player himself or herself does not know or remember his or her ratings. Or it is simply missing in the process. By the way, a chess player should know and remember his / her ratings. Yes, our national ratings need further improvement but it requires time. Insya Allah, GiLoCatur will try to talk about this matter in other time. You can check your ratings at Gilachess website at below link. So, back to the seeding. GiLoCatur should be seeded more than 60th since based on GiLoCatur's check at the above link at least 20 more players have 1500s and 1600s MCF ratings. GiLoCatur's first opponent is a novice or beginner. He played black. We were at table #41. As usual, GiLoCatur played Queen Gambit and GiLoCatur believes the opponent did not have a clue what opening is being played. He gave away (blundered) two pieces - a knight and a rook during the opening stage. One more thing, he kept asking GiLoCatur while recording his moves. Recording is very important when participating in chess tournament. Malaysian chess players especially the beginners need to take note of such importance. It is very common in the Malaysian chess scene especially in the rapid format that many players do not record. The discipline in recording chess moves of IM Mas should be followed by us. That's why GiLoCatur prefers G/45 and G/60 format or time control because normally record moves is compulsary like in this tournament. It gives GiLoCatur comfortable time to record and keep a copy of it. 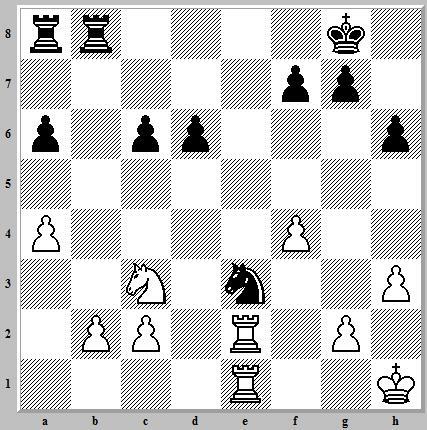 Chess Clubs in Malaysia must teach their members about this aspect. Make it a practice to record during club practice. 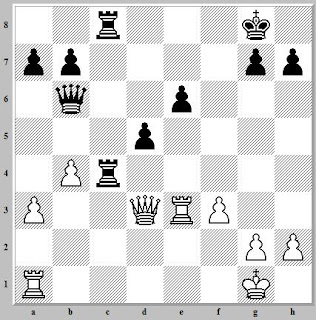 In the second round, playing black GiLoCatur played French Defense against a non-rated player. A check at Malaysian Chess Rating, he has actually about equal ratings as GiLoCatur. He castled queen-side and left the d file open for GiLoCatur. His strategy was to capture as many pawns as possible but leaving the king open for attack. In the third round, having full 2/2 points GiLoCatur was paired against Mohd Fadzil Nayan at table #4 who is rated 500 points higher. Surely, GiLoCatur is a no match for him. GiLoCatur had a bad move on the 10th resulting in a fork. GiLoCatur's next opponent was Muhammad Hairul Masdol (below picture). He is a non-rated player. After his 32nd move, GiLoCatur has the winning edge when one piece up and managed to fork his rook and queen. But unfortunately, due to the time pressure and inaccurate moves GiLoCatur lost the game when his two pass pawns were unstoppable. Due to his lack of tournament exposure, he did not claim when GiLoCatur's time had already ended. Hairul told GiLoCatur that he normally has the sparring session near KL UTAR near Wardieburn Camp. In the fifth round and the final game of the tournament's first day, GiLoCatur was paired against a University student named Mohd Haniff Sidek. GiLoCatur was late about 7 minutes since need to send GiLoCatur's wife, Anis and Fahim to the chalet where we stayed over the night. It was the lowest board for GiLoCatur at the tournament after two wins and two defeats. GiLoCatur got the advantage when managed to have double rook in the 32nd move. What made GiLoCatur happy is that GiLoCatur managed to convert the advantage to a win and did not fumble in the endgame stage. So, GiLoCatur had 3/5 points at the end of the first day. During the same round however, GiLoCatur's eldest son, Fikri lost to his opponent whose name is also Hanif. After having three consecutive wins, Fikri had two consecutive defeats. In the second day of the tournament, GiLoCatur won another two games and lost one. Once again, GiLoCatur had a double rook combination. It was lethal because GiLoCatur managed to capture opponent's rook. 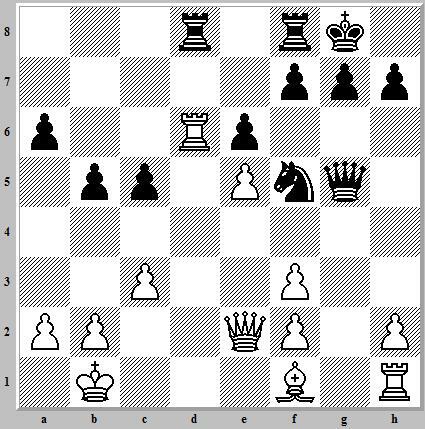 Then, the win was GiLoCatur's when the opponent allowed GiLoCatur to have double rook combination at the 7th rank. In the seventh round, GiLoCatur was paired against below player. Based on the name in the pairing list, GiLoCatur quickly identified him. He was the first runner up in the recent Cerdik Catur Semi Pro tournament. He said that he just made a comeback to chess tournament as a warm up for his coming inter-BSN chess competition. GiLoCatur had already found out about his old ratings. He was rated at 1556 but under "Nor Zaisoon Yahaya". Surely, GiLoCatur found out that he is a very strong opponent and played solidly. GiLoCatur did not reply correctly when he made 8. .. e5 move. 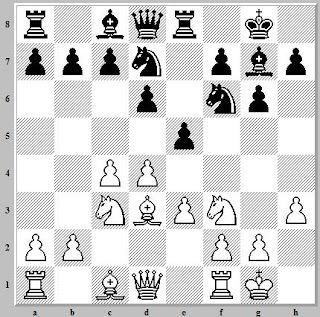 GiLoCatur thought that 9.e4 is the best move. His e pawn need to be stopped from marching to e4 square or else a fork for GiLoCatur. GiLoCatur's low-version Fritz suggests to move the white bishop on d3 square. Any other suggestion? GiLoCatur did not anticipate the danger of the Queen. 15. .. Qh4 really suprised GiLoCatur. GiLoCatur could resign at this stage but GiLoCatur continued to see how GiLoCatur "dikerojekan". In the last round, GiLoCatur was very lucky for being escaped from "dikerojekan" by the only GiLoCatur's lady opponent. If in the previous rounds, GiLoCatur used the lethal "double rook" combination to win, this time around GiLoCatur's opponent had the combination. Luckily, with one knight down GiLoCatur managed to "mengKerojekan" her. GiLoCatur believes she would be so frustrated that she lose and could not "mengKerojekan" GiLoCatur. That is chess. You have to fight until the end especially if you play against amateur chess players like GiLoCatur. 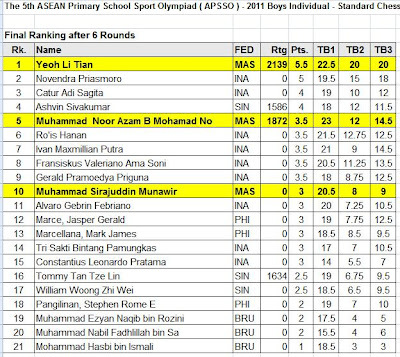 The respective Age-Group category Champions shall be Malaysia’s Official representative at the Asian Schools Chess Championships to be held 16 - 23 December 2011 in New Delhi, India. "Abe, buleh ko kite mene hadiah ni? hebat2 belako hok mari bertanding ni ..."
TWO below photos show among players who had the golden moment playing against the top two seeds on the podium. 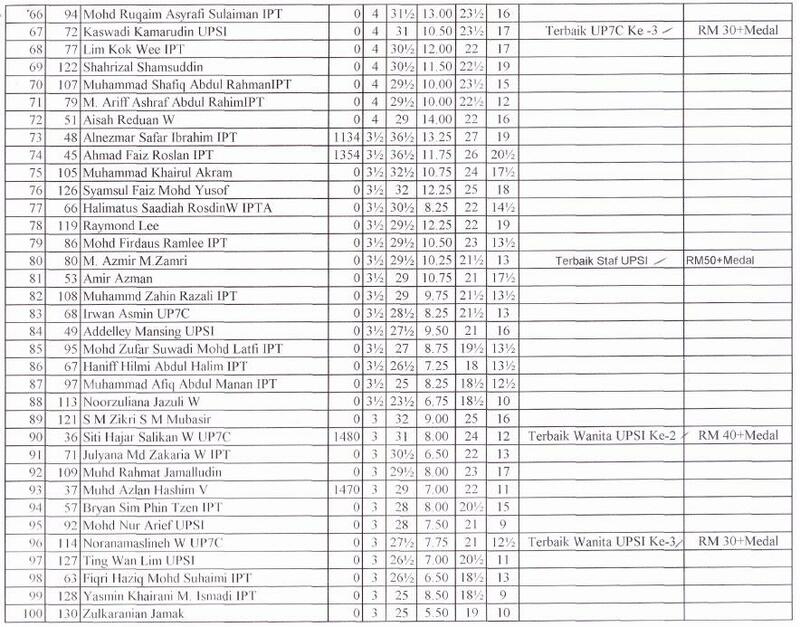 "Dua keping gambar di bawah membuktikan betapa popularnya abg Bro Mudin yang terkenal dengan skill MAMAKnya"
Below is the final ranking of the 5th UPSI Chess Open for the Open category emailed to GiLoCatur by Kelab Catur UPSI 90 minutes ago. During the closing and prize giving ceremony for the UPSI Chess Open today, all the winners came to the podium to receive their medal and prize money after two days of gruelling chess matches. 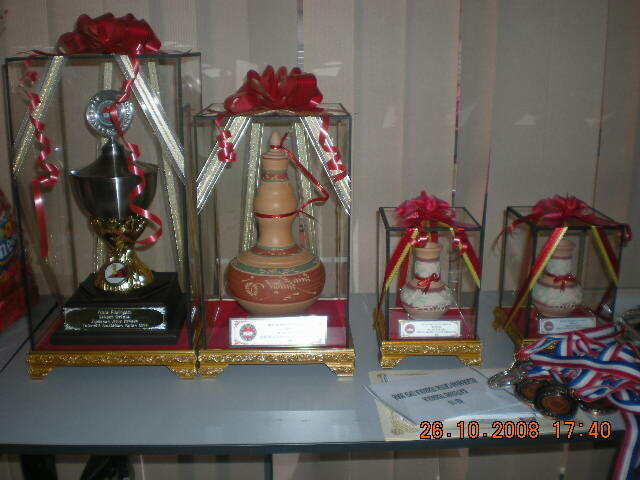 Three categories were competed in the tournament. Due to low participation in both primary and secondary school categories, the number of rounds were reduced from seven to six rounds. The format of play is 60 minute (G/60) per player. Three rounds each day. While in the open category, the number of rounds is increased from seven to eight. This is because the number of participants is close to 130. Due to majority vote, one more round is added in the first day to make it five rounds. The time control is reduced from 60 minute (G/60) to 45 minute (G/45) per player. But the time control is as per schedule, 60 minute per player, in the second day. Thus, the tournament ended at 10pm in the first day, two hours late than the schedule. What a gruelling first day of chess tournament for a five rounds of 45-minute time control. Normally, only four rounds for such time control in one day. It is really tiring especially for GiLoCatur since has to send Anis and Fahim as well as their mother to a chalet resort where we stay for the overnight before the last round for the Open category starts at 8.00pm. It is about 15-minute drive to the chalet known as Kalumpang Resort & Training Center (KRTC) that is located 10 kilometers from the tournament venue. GiLoCatur has many to update on the tournament. In this entry, let's GiLoCatur first update on the champions for each category of the tournament. The champion in the primary school category is Izzah Halim. She won all her first five rounds. In the last round, she drew with her younger sister, Farhana. Izzah came all the way from Segamat, Johor with her family where his father and younger brother also took part in the tournament. The champion in the secondary school category is Mohd Aziz Farhan. He scored 5/6 points from 4 wins and 2 draws. He came to play in this tournament with his elder brother, Daniel Iskandar, who is the second runner up in the same category. As expected, the Malaysian top chess player IM Mas Hafizulhelmi has a rivalry with the former UPSI chess open champion, Ian Udani the Malaysian-based Philippines chess player. They drew against each other in the seventh round and won all their other rounds. Both have equal score of 7.5/8 points. But IM Mas is declared the champion due to better tie break. Syabas and Tahniah to all the category champions in the fifth edition of UPSI Chess Open. Until we meet again, Insya Allah, in the sixth edition next year. In the standard category of the 5th APSSO, Malaysia won TWO gold medals and ONE silver medal. Li Tian anchored the Malaysian boys to win the gold medals in both the boys individual and team categories. While Puteri Rifqah Fahada won the silver medal in the Girls Individual Standard event. Puteri Rifqah, the only girl in the four-players Malaysian chess team, excelled in the rapid category after winning the gold medal. She just drew once in the six rounds event meaning she scored 5.5/6 points. If GiLoCatur is not mistaken, it is the first gold medal ever won in the girls category in the APSSO. Syabas to Puteri Rifqah when she contributed ONE gold and ONE silver. Meanwhile, Li Tian's golden victory in the standard event did not continue in the rapid category. Indonesian player, Novendra Priasmoro, defeated Li Tian in the fourth round to deny Li Tian's effort to win gold in such category. In consolation, the 12-year-old Malaysian player won silver and bronze in Boys Individual and Team categories respectively. 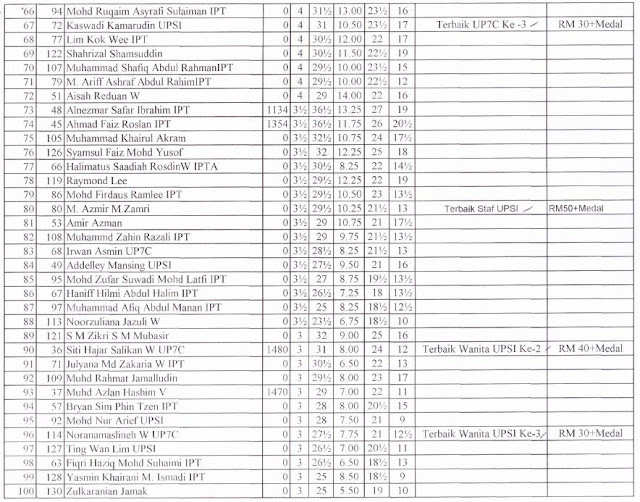 In short, the medal tally for the Malaysian chess team in this year APSSO are 3 Golds, 2 Silvers and 1 Bronze. Congratulation! Will this year edition have nice Champion Trophy? There are TWO announcements regarding UPSI Chess Open to be held this weekend from UPSI Chess Club. The registration closing date is extended to Friday, 14th October 2011. So, those who have yet registered may do so tomorrow. 120 names have registered in the Open category so far, about 40 secondary and 30 primary school pupils are ready to take the challenge in their respective categories. 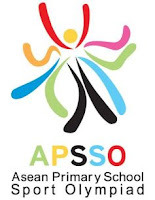 Will Malaysia excel in the 5th APSSO held in Yogyakarta, Indonesia from 8th until 15th October? Will Malaysia emerge as the overall champion again like last year? Will Chess become the main gold medal provider for Malaysia again? We will know the answer for the above questions after the mini Olympiad is over, won't we? Let's look at chess which is one of the five sports in the event. First, let's see who are the players in the Malaysian chess team? The team which consists of there boys and one girl is anchored by the Malaysian top Under 12 chess player, Yeoh Li Tian. The other team members are Sirajuddin Munawwir Ahmad Fuad, Noor Azam Mohd Nor, and Puteri Rifqah Fahada Azhar. Sirajuddin is from Kedah while both Noor Azam and Puteri Rifqah are from Selangor. The standard chess category had just completed yesterday. As far as GiLoCatur acknowledge, there are six categories in the event - Individual Standard and Individual Rapid each for boys and girls (4) as well as Team for both Standard and Rapid ONLY for boys (2). 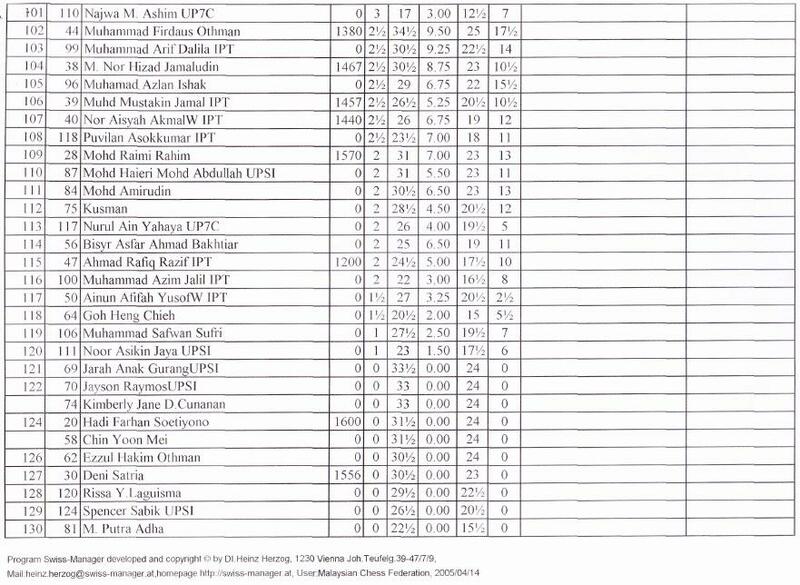 Puteri Rifqah managed to score 4.5/6 points from three wins and three draws. Unfortunately, she is placed second when her first round opponent, Shanti Nur Abidah of Indonesia, came back strong to win five next consecutive rounds. Shanti edged Puteri Rifqah just by half point. Syabas and tahniah to Puteri Rifqah for bagging the silver medal in this category. Li Tian has secured a gold medal in the boys category after scoring 5.5 points from the total six rounds. Congrats and bravo to him. He drew with the first runner up, Novendra Priasmoro of Indonesia, in the fifth round. 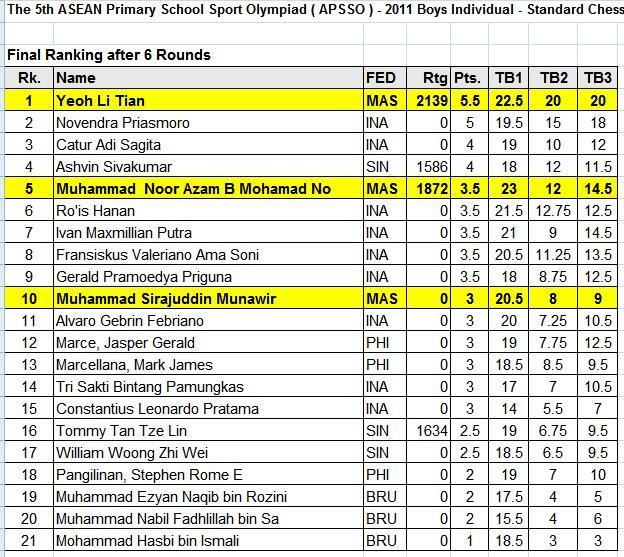 Meanwhile Noor Azam and Sirajuddin are placed 5th and 10th respectively. The former had two wins, three draws and one defeat to team mate Li Tian. While the latter won three and losing three. As a team, Malaysia surely wins a medal in this standard category. GiLoCatur believes the Malaysian team at least wins the silver medal. GiLoCatur is not sure whether it can win the gold medal with 12 total victory points. Because GiLoCatur does not know the three Indonesian team compositions. Indonesia has one player with 5 points, one player with 4 points and four players with 3.5 points. The first team event scoring method is the total victory points of the three players. The best combination (victory points) for Indonesia is 12.5 points (5 + 4 + 3.5). Next is 12 points which mean both countries - Malaysia and Indonesia, have tie points. The second tie break for the team event is based on the total ranking of the three players. GiLoCatur did not take part in the INSOFAR 2nd Open Scholarship tournament held today at Shah Alam PKNS complex. But GiLoCatur did drop by to watch the last two rounds and snapped several pictures. In the 1st edition held at DATCC, the number of participants was only eleven including GiLoCatur. Today, in the 2nd edition sixteen players took part. It is a bit tougher this time. There was no unrated player. Only two are under 1500 national ratings. There were few dramatic matches in the final two rounds - the third and the fourth. In the third round, the 1st edition champion, Abdul Haq who is also known as the Incredible Haq, was held a draw by Syazwan. While in the fourth and final round, Chek Kin Keuw managed to hold up a tension match against Sahir Sarifdin. The match was the last to finish. With that win, Kin Keuw became the 2nd runner up after winning on tie break over Syazwan Zulkifli and Mohd Raimi Rahim when the three of them scored 3/4 points. Below are the top three prize winners. If IM Mas, the current Malaysian top chess player, became the champion in the DATCC Master Blaster Blitz, the Malaysian first IM, Jimmy Liew became the champion in the Insofar 2nd Open Scholarship tournament. THE 3RD EDITION WILL BE HELD NEXT MONTH ON SUNDAY MORNING, 2OTH NOV AT SHAH ALAM PKNS COMPLEX. THE EVENT MAY BE NATIONALLY-RATED. HURRY UP, REGISTER YOURNAME VIA SMS TO 017-2032051. BEST OF LUCK FOR YOUR PMR MY SON, FIKRI!